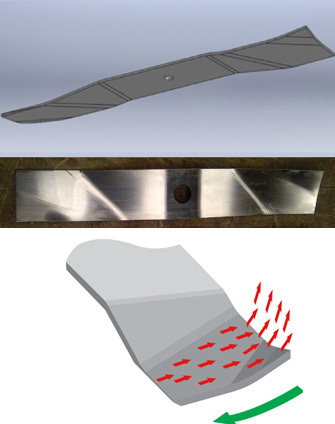 Unique bend process creates a “lift” of the outer section of the blade and the additional “sail” produces massive air flow and discharge. Mulching action is incredible, no clippings, no windrows, no clumps. The unique triple bend creates a bevel sharp edge on the bottom side. NO need to remove the blades to resharpen. Blades available for most commercial rotary mowers – Heavy Duty or Ultra Thin Profiles. To re-sharpen leave the blades on the mower and grind bottom edge. Maintaining a crisp sharp edge = healthier turf and improved equipment performance.